Where does one draw the line between following a policy, and appearing as an anti-Semite? According to a recent Washington Post article, a University of Michigan professor rescinded his offer to write a study abroad letter of recommendation for a student after he found out that she was planning on studying in Israel. John Cheney-Lippold is a professor of cultural studies at the University of Michigan. Photo via the University of Michigan. 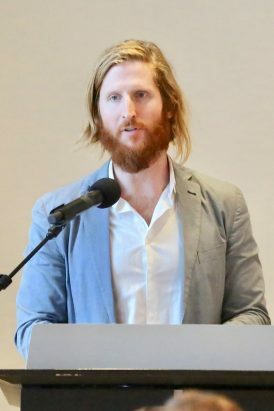 In an email, Professor John Cheney-Lippold explained to the student, Abigail Ingber—a junior at the University of Michigan’s College of Literature, Sciences and Arts—that he would not be able to write her a letter of recommendation for her study abroad because of his university department’s policy. We believe that Cheney-Lippold was wrong for rescinding his offer to write a letter of recommendation, but that this refusal itself does not prove him to be anti-Semitic. It is Cheney-Lippold’s right to follow his conscience on the issue as he sees it, and his support for Palestinians should not be equivocated with anti-Semitism. Cheney-Lippold was first accused of being an anti-Semite by an online Zionist organization named Club Z, which referred to the U.S. Department of Education’s most recent definition of anti-Semitism to include “demonizing or delegitimizing Israel, or holding it to a double standard not expected of other democratic nations, are deemed anti-Semitic.” However, Cheney-Lippold did not mention opposing Israel itself or students visiting Israel, but rather opposed engagement with Israeli academic institutions. But after failing to read a key detail in Ingber’s original inquiry, Cheney-Lippold’s mistake is no excuse for him to go back on the promise he made to a student. It was wrong of Cheney-Lippold to rescind his offer to write her letter after he had agreed to. By rescinding his offer, he put the student, who he had previously agreed to help, a step back in her study abroad application process. Study abroad opportunities can be a unique and rewarding part of a student’s college experience, and politics should not have prevented a professor from giving his student this opportunity. If Cheney-Lippold had told Ingber upfront that he could not write the letter, there wouldn’t be as much of an issue; but he did not let her know until weeks after his initial agreement. At that point, it may have been too late for Ingber to ask another professor for a letter of recommendation. She may have had a closer relationship with Cheney-Lippold than any other professor, and thus he may have been better suited to recommend her for the program. Either way, Cheney-Lippold should not have backed away from his offer after waiting so long to see his mistake. After he realized his mistake, he should have emailed the student explaining his viewpoint, but letting her know that he would still write the letter anyway. This way, the student would be aware of his opinion on the country she’s traveling to and could decide on her own if she would still like him to write her a letter or if she should find someone else. Some have said that Cheney-Lippold should not be punished because recommendation letters are simply a privilege, rather than a right afforded to students. This may be correct, and if he had noticed the destination of the study abroad program earlier, he could have used this reasoning to defend his decision; but this is not what happened. Cheney-Lippold and Ingber had an agreement, and for weeks she relied on that agreement to go on a study abroad trip. For this reason, his politically-backed refusal to ultimately write the letter is unacceptable. No Replies to "Michigan professor was wrong to rescind letter of recommendation, but should not be labeled an anti-Semite for it"